It must go down among the biggest porkies a man ever told a woman – right after Christopher Columbus telling his mother he wouldn’t be long; he and a few friends were just taking their boats out for a spin. And, never has the term “farm”* been used more euphemistically than when Felipe V of Spain told his wife that he was going to buy a small farm at the foot of a hill for their summer retreat. 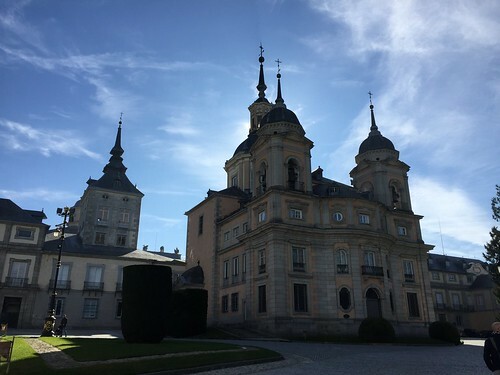 In fairness, when he bought it from the monks of Santa Maria del Parral in nearby Segovia, it was little more than farm with a small almshouse for the poor. Felipe just conveniently forgot to mention that little bit about his intention being to turn it into a second Versailles. Such minor details have never been known to be the cause of strife between husband and wife, after all. Nonetheless, one might sympathize with this young French king. Used to the opulence, lush greenery and cascades of his father’s grandiosity, he sought relief from the arid meseta of Castille in the northern freshness of the Guadarrama mountains. The humidity and pine pitch aroma of this narrow range to the north and west of Madrid offering respite from the alternately baking and freezing dryness he so hated. Some sympathy was also forthcoming from Felipe’s art-loving second wife, Elisabetta Farnese, who, when it became clear that her husband’s plans for their country getaway were a mite more ambitious than a log-cabin, readily assisted him in emptying Spanish crown coffers on gargantuan quantities of imported green, red and yellow marble and oils by her favorite Italian masters. Having been born third in line to the French crown, and only acceding to the Spanish throne when his great-uncle Carlos II died childless and named him as the rightful successor, Felipe was always a reluctant leader. It’s also quite likely he suffered from mental illness, a condition exacerbated by the stress of leadership, and this may explain why his vision for La Granja was not just as a country retreat, but as his retirement home. 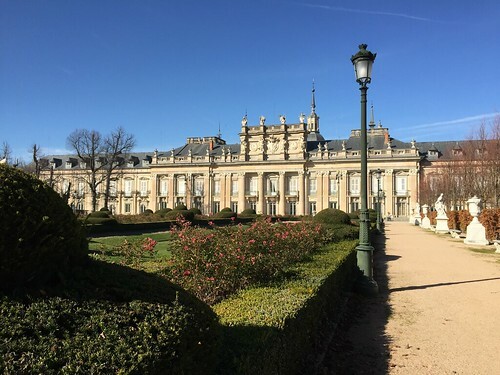 At the age of only 41, Felipe abdicated in favor of his 17-year-old son Luis, and retreated to his palace to live in seclusion. Alas, for both he and his son, following a short battle with smallpox, the teenage king died, forcing Felipe to return to the throne. Once re-installed, he did not wish to leave his retreat in the hills, and so around La Granja grew up the town of San Ildefonso. First a military barracks and riding school, followed by the collegiate Church of the Holy Trinity and a munitions and glass factory. Naturally, as the seat of the Royal Court, the Spanish nobility also began to move in, building the kind of modest pied-a-terres and game lodges their tastes demanded, turning La Granja into small, exclusive enclave facing the Castillian plain and backed by their own private game reserve in the thickly wooded mountains. 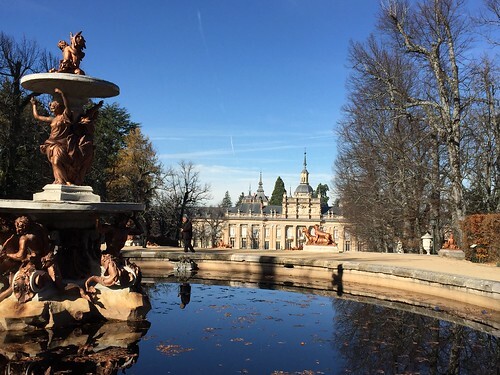 So it remains today, with the exception that the palace is open to the public and the retreats of the nobility are now weekend retreats and summer homes of well-heeled Madrileños. 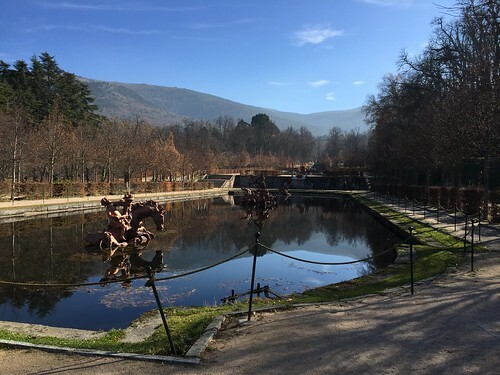 While they are perfectly nice mountains, replete with babbling brooks, fern-filled glades and bald peaks, the Guadarrama is not among the world’s most arresting ranges. 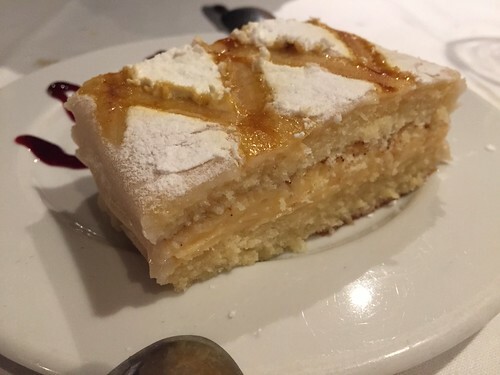 For its piney-green lumps to be truly eye-catching one must have reached the point at which the nibbled, camel-colored cloth of the Castilian meseta feels somehow fearsome. Indeed, Felipe’s Bourbon family represented perhaps the apogee of this agoraphobia. Spanish royalty who, for generations had fought the Moors for every wretched scrap of barren earth, now restricted themselves to scurrying between cloistered royal residences across their vast territories, fearing contact with their subjects and their physical reality. In As I Walked Out One Midsummer Morning, his wonderful pre-Civil War memoir of Spain, Laurie Lee describes happening upon La Granja one day on his way to Madrid from Segovia, and, all alone apart from beetling gardeners, he witnessed the magnificent play of the palace garden’s fountains. Even in the 1930s, this was a blithe coincidence. Today, they only run for half an hour a week in the off-season, and our visit did not coincide, but it must have been a truly astonishing experience especially in the height of summer with the cooling effect of all that gushing water at its most thirst-quenching. 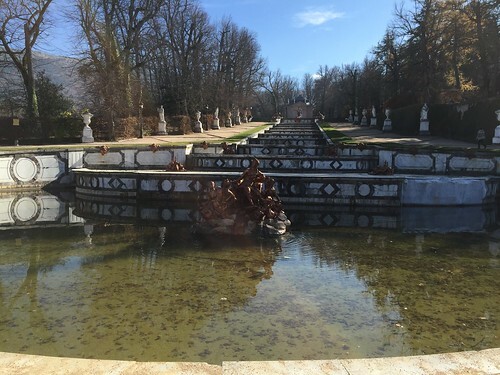 The fountains, numbering in the hundreds and all connected via a vast system of pools and channels, are a mix of muscular Gods, nubile nymphs, playful sea creatures and ravening dragons laid out in a complex geometry to reveal vistas of spouting water along dusty beech hedge allées. During our November visit, the fountains and pools were becalmed and murky, but their bronze accents matched the burnished russet of the beeches’ autumnal foliage perfectly. These hedges do not drop their leaves until they are pushed off by new growth in the spring, so maintaining their tawny symmetry throughout the winter in memory of the sandstone trim of Felipe’s palace and as a counterpoint to piercing blue sky. 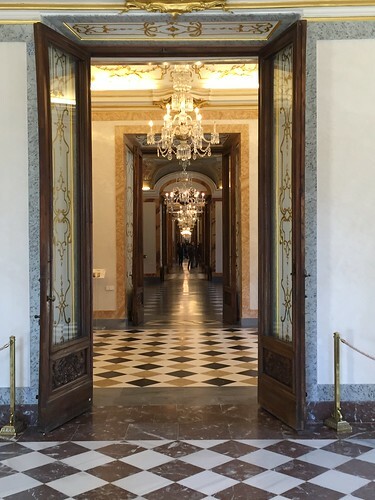 And while the palace interior has that vulgar opulence familiar to Bourbon royalty, even the magnificent interplay of colorful marbles echoing rich silk drapery and Brazilian hardwood furniture, seems somehow diminished compared to the scale of the artesian system outside. We walked among it for several hours and could have explored for several more without surveying all the decorative pump-houses and half-hidden reservoirs. Hydromania feels like the appropriate term. The extent of La Granja was only emphasized by the almost complete lack of other visitors. I imagined the newly-retired king strolling his private domain towards the bosky slopes beyond and feeling wonderfully liberated from his inherited burden. For us mere peons, the exercise and brisk, mountain air made us ravenous, forcing us to curtail further exploration of Felipe’s ornamental gardens in favor of lunch. Seeking hostelry, we turned our attentions to the sloping streets of the sleepy town, settling on Taverna del Pelon and its menu filled with recent inhabitants of the surrounding mountain forests. And, like the French king, as he is known in Spain, we did not allow the scale of our ambitions to be checked by mortal limitations. Immoderate raciones of partridge escabeche salad and sautéed lambs sweetbreads with caramelized onions preceded the obligatory judiones de la Granja – a filling dish of frankly enormous, buttery white beans in a smoky broth of pork and pimentón. It was with some relief that we noticed that the portion of roasted suckling pig which followed was slightly less generous than that of the previous day’s lunch in Segovia because it permitted us to sample a mouthful of Segovia’s famous “ponche” for dessert, a spongey confection of vanilla custard and powdered sugar. An almost purple tempranillo from Ribero del Duero accompanied this heroic lunch, but we descried the proffered digestivo owing to our post-prandial journey through the switch-backs of the Guadarrama and on to Toledo. Regardless, confusion on windy mountain roads ensued when the app detailing Spanish highways and byways kept placing us miles from our current location and advising us to turn around. Happily though, climbing the mountain more than once afforded us a deeper appreciation of what Felipe sought in La Granja. Slopes thick with pine, the almost medicinal aroma of pine-needle litter, and the circling buzzards aloft on rising zephyrs, felt a world away from both the manmade baldness of the meseta and the starched order of La Granja. 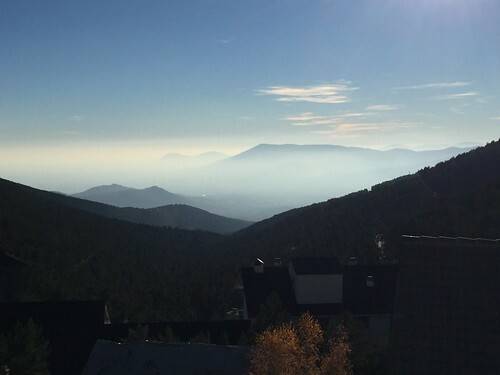 At the pass of Navacerrada, where a ski-lift stood forlornly awaiting winter’s first snow, we stopped and gazed. Laced with a wispy veil of cloud, the view took in miles of green valleys, blueish foothills and drab grey suburbs. With binoculars we might have been able to see Felipe’s other home, the Palacio Real in central Madrid. To our right, a spring burbled through a shiny tap. Collecting some delicious icy water, I scaled the slope above it feeling that this was where Laurie Lee had camped before descending into Madrid. The fetid pile of turds decorated with swags of besmirched toilet paper I encountered behind a thorn bush was a reminder of the encroaching city. Behind us, the cool leafiness of La Granja; ahead, across a scarce 20 miles of scarred plain lay Spain’s largest city. Beyond it, the royal city of Toledo and the waterless expanse of Castilla-La Mancha. *La Granja means “the farm” in Spanish. 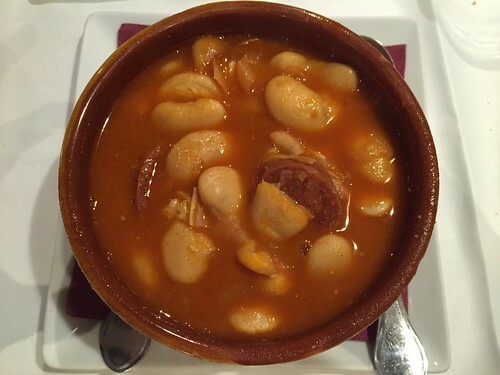 The giant local beans, judiones de la Granja, are known throughout Spain not primarily for their size but for their silky texture. I wish you’d been born in the 1930’s or ’40’s and grown up to be a history book author for High School textbooks; by my term in the ’70’s I might have actually enjoyed the class and Yes! learned something. The dishes of food seem likely historical as well and no wonder they are still offered, it all sounds excellent. The food would be included in the book. And the pictures. Of course. Have I flattered you enough? No? Ok, do you know any exceptional works (besides yours! 🙂 ) on Segovia that I might read? I really have enjoyed reading this, thank you! @Deborah: as usual, you are too kind but flattery will get you everywhere. Very glad you enjoyed this post. I certainly enjoyed writing it. 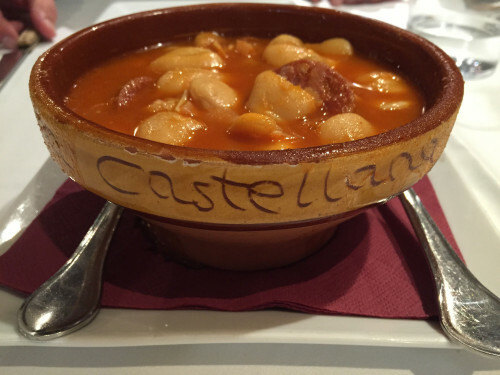 If you ever have the chance to visit Spain again, La Granja should be on your list. It’s quite magnificent. And, funny you should mention it, because I’ve always fancied myself as a bit of an Indiana Jones. Just like every other kid who was 10 in the 80s, I guess. The idea of being a history teacher also appeals – provided, of course, I could spend half the year exploring…. Very few authors found Segovia enough for a whole book. Most just devote a few pages or at most a chapter to her -other than Segovia in Your Hand which is little more than a glorified guidebook. Laurie Lee’s book deals with Segovia only briefly but very nicely. Jan Morris also mentions Segovia in her/his “The Essence of Spain” excerpts of which are featured in “Spain in Mind”. Cees Nooteboom talks about it briefly in “roads to Santiago” also but I have yet to find a whole book on the city, though it certainly deserves it. 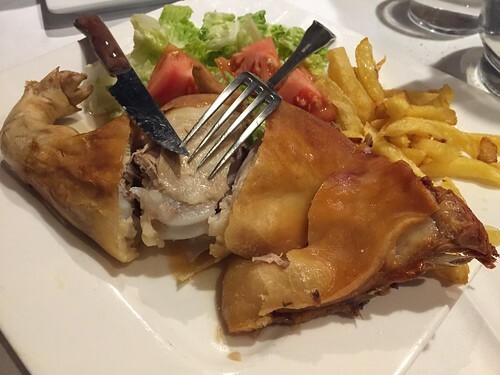 Food-wise, judiones a la granja are certainly traditional and of peasant origin. 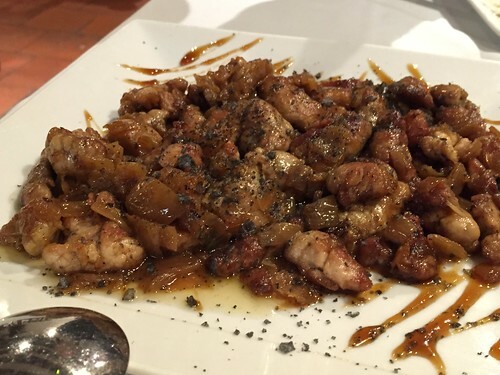 The partridge in escabeche is also native and very common to that region as well as to La Mancha. We had to turn a can of it over to the Spanish authorities after failing to pack it in our checked luggage on our way home. It was a painful loss but Jim Harrison’s recent passing reminds us that partridge is available here if one looks hard enough or knows someone who hunts, so we remain hopeful. Whoa, I didn’t know Jim Harrison died recently–where have I been? He’s one of my favorites, after I saw him interviewed on Bourdain’s show once–I just put a couple more of his books on my wish list to order–jeez, I’m really sad about that, he’s a hell of a writer and I love his food writing too. @Deborah: yes, monday or Tuesday last week I believe. He was terrific. The Raw and the Cooked is (for me) the gold standard in food writing. His novellas are terrific too. So powerful and gutsy. It was he with his writing about tarpon fishing in the Keys who convinced me that Florida was worth a visit and that the entire state wasn’t just Disney and child-molesters. Some feat. There’s nothing like piles of unread books. Umber to Eco used to pride himself on the number of books in his library that he hadn’t read. He said it used to inspire him to get up everyday. Yep, now in his honor I’m going to re-read Raw & the Cooked, great work. The stories about his Upper Peninsula are just magical. I don’t know the Florida material but I’m pretty sure I have at least 15 books of his fiction so maybe it’s there and I’ve forgotten it. @Deb: I am familiar with Open Culture, but rarely visit. Sounds like I should do though. Eco’s books – his non-fiction anyway – is pretty humorous. Travels with a Salmon, in particular, is an amusing dissection of popular culture through the eyes of a professor of semiotics. Revealing stuff. That is some delicious looking food, especially the salad. 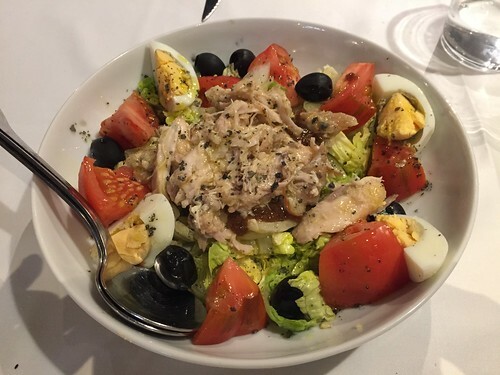 Reminds me of cobb salad!